Eek! Thanksgiving is early this year. I almost let it slip by me. But don't panic if your in the same boat. Here are some great Thanksgiving recipes fit for any gluten free, vegan friendly, table for this year complete with a few variations just for fun. 1. 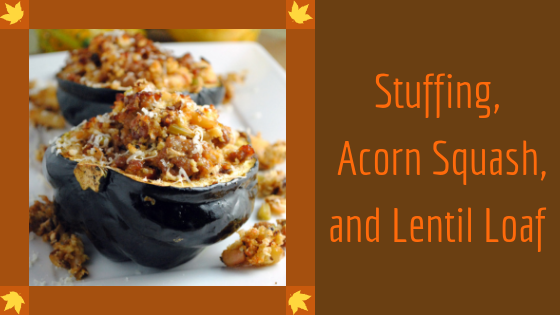 Acorn squash is one of my favorite fall flavors. On top of it's deliciousness, it's super easy to roast and stuff. The flavor of the squash works well with a number of different stuffing options as well. This recipe does not include the stuffing because I have several options for you to choose from below. Preheat your oven to 400. Brush each half of squash with melted ghee and stuff 1 cup of your chosen stuffing in each half, season to taste with salt and pepper. Wrap each half tightly in foil. Bake, covered, for about 1 hour. In the last 15 minutes of cooking, remove the foil to allow any extra liquid to cook off. Transfer the Squash to your serving platter, carefully. If you have any stuffing left over, you can arrange it around the squash on the platter. 2. Lentil Loaf is a staple in my home. It's super easy to make and can be extremely versatile. In this recipe I'll guide you through how to stuff your Lentil Loaf. I'm not including the stuffing here because further down there are a few stuffing recipes and variations. Any of those stuffings will work well for your Loaf. Mix together the ground chia seeds and water. Place in the fridge to chill. Reheat oven to 350 degrees. Rinse and drain the lentils and add them to a stock pot with the vegetable broth. Bring to a boil, then reduce heat to and allow to simmer about 30 minutes. Strain (optional- you can save the broth to cook your rice in for more flavor) and mash while hot. Set aside to cool. In a skillet, sautee the ontion and garlic in oil for 3-5 minutes, or until soft and just transparent. Combine with mashed lentils, in a large bowl. Add in rice, salt, pepper, and chia seed mixture. Mix well (optional- combine in a food processor and process until smooth for a more turky-like appearance). Line a loaf pan with parchment paper, leave the edges coming out of the pan. Fill the bottom of the lined pan with a little more than half of the lentil mixture, make sure to get up on the sides, but leave space in the center. Fill with 2 cups of stuffing. Put the remaining lentil mixture on top of the stuffing and seal the loaf. Cover with foil and bake for 45 minutes. Remove the foil and bake an additional 15 minutes. Gently pull loaf out of pan using the parchment paper. Remove paper and arrange on your platter. Slice carefully. If you have any stuffing left over, arrange it on the platter as well. 3. This is one of my favorite stuffing recipes. It's super tasty and really easy. This stuffing goes so well with so many different dishes, and you can easily make it into a salad by serving it over a handful of fresh, baby greens. Chayote squash is a great vegetable found year round here in Florida. It can be eaten raw or cooked and has a slightly cucumber-ish flavor. If you cant get chayote, try butternut squash for a delicious fall flavor. Rinse your quinoa very well and allow to drain. While your quinoa is draining, pour about 1 tablespoon of olive oil (or ghee) in a sauce pan and heat over medium-high heat. Add the drained quinoa and cook, constantly stirring, to allow the remaining water to evaporate and toast the quinoa. This should take about 2 minutes. Add in the broth and bring to a boil then reduce heat and allow to simmer for about 15 minutes, covered. Don't stir or lift the cover! Remove the saucepan from heat and allow to sit for an additional 5 minutes....still no peeking! Remove the cover and fluff your quinoa. If any liquid is remaining at the bottom, return it to the heat for 5 more minutes. Otherwise, toss that quinoa into a large mixing bowl to await the other ingredients. Heat another tablespoon of oil (or ghee) in a pan and add your veggies (chayote, celery, carrot, onion, and garlic). Cook over medium heat, stirring frequently, until veggies are nice and tender (about 20 min). Now it's time to add in your sage, thyme, salt, and pepper. Mix together while cooking for just a few more moments. Then toss 'em all in with the quinoa. Add in your parsley and the remaining oil. Toss well to combine. 4. Falafel stuffing? Sounds weird, I know, but it's DELICIOUS! This recipe does take a bit of work because you'll be making your own falafels to use, but the result is amazing and totally worth it! This works equally well as Tamiya (an Egyptian version of falafel), just use fava beans instead of chickpeas. Smash all of your falafel (make sure they are broken up into large chunks, but not completely ground) and place into a large mixing bowl. In a skillet, heat olive oil (or ghee) over medium heat. Add in butternut squash, onion, celery, and garlic. Cook, stirring frequently, until veggies are tender. Combine with falafel and remaining ingredients. Mix well to combine. 5. This stuffing is a great way to sneak some extra healthy veggies into your family's Thanksgiving. Jam packed with cauliflower, beets, celraic, and so much more. You can also eat this as a roasted veggie salad, over a bed of fresh baby greens. In a large skillet, over medium heat, warm the oil (or ghee). Add onion, garlic, and carrot. Cook until soft (about 7-8 min). Add in Beets, Celraic, and Cauliflower. Cook until tender (about 7-8 more min). Add in remaining ingredients and cook until liquid is absorbed (about 10 more minutes). Optional- roast in a preheated oven for 10 more minutes with a little ghee or olive oil. 6. For all of my Shroomies out there, this stuffing is awesome! It's packed with mushrooms and herbs to make your Thanksgiving out of this world. The creamy element is cashew milk so it's perfectly great for all you vegans as well! In a saucepan, combine wild rice, brown rice, and broth. Bring to a boil. Cover and reduce to a simmer. Cook until rice is tender and the kernels pop open, takes about 45-60 minutes. Uncover the rice, remove it from the heat, and fluff it with a fork. In a skillet, heat oil (or ghee) over medium heat. Add in onion, garlic, celery, and carrot. Cook until tender (about 7-8 min). Add in the mushrooms and continue cooking an additional 10 minutes. When done add it to the rice with the sage, thyme, and cashew milk. Put it back on medium heat and cook until thick and creamy. Add in the parsley and toss to combine. I hope you enjoy these recipes! Let me know what you think down below!